The print by Sharaku of Otani Oniji which forms the main tattoo design is one of the best-known prints of the enigmatic Sharaku, who only produced prints for a short time in 1794-5, but who has left us around 140 designs from that brief period. 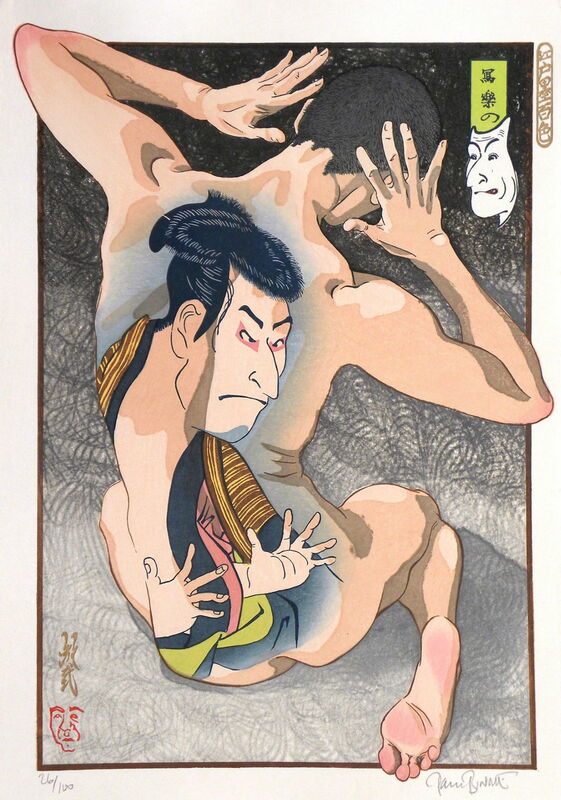 The unusual position of the hands in this print were the key to the dramatic, dynamic pose of the model, for though they represent the frozen action of the Kabuki stage, it could be the model is reacting to a loud noise or shock, and he is instinctively moving to protect himself. The similarity in the position of the hands of the tattoo and the live man is vital to this design. The small cartouche shows Ichikawa Ebizo, maybe one of the most striking faces in this group, and one which well deserves to be used as a caricature, and the seal here is Paul’s own self-caricature, made up of the letters of my name. This is the ninth design in the continuing series Edo Zumi Hayaku Shoku (A Hundred Shades of Ink of Edo) of tattoo prints.